Bowknot Bend, Utah (NASA, International Space Station, 01/22/14) | Flickr - Photo Sharing! This sector of the Green River canyon in eastern Utah is known as Bowknot Bend because of the way the river doubles back on itself. The loop carries river rafters 14.5 kilometers (9 miles) before bringing them back to nearly the same point they started from—though on the other side of a low, narrow saddle (image center). In this photograph taken by an astronaut on the International Space Station, the Green River appears dark because it lies in deep shadow, 300 meters (1,000 feet) below the surrounding landscape. The yellow-tinged cliffs that face the rising sun give a sense of the steep canyon walls. The straight white line across the scene is the contrail from a jet liner that passed over Bowknot Bend. Note that north is to the bottom of the image. The reason for the tight bends in the Green River is the same as it is for the Mississippi: river courses often wind over time when they flow across a bed of relatively soft sediment in a floodplain. Geologists assume that the Green River, before its present canyon phase, once snaked across a wide valley on a bed of its own sediment and made a series of striking meander bends. Vertical uplift of the entire landscape—by deep-seated tectonic forces related to the growth of the Rocky Mountains—caused the Green River to erode downwards into the hard rocks under the valley. In the process, the present vertical-sided canyon was formed, preserving the tight loops reminiscent of an earlier time. Bowknot was named by geologist John Wesley Powell in 1869 during one of his famous explorations of the rivers in the American West. 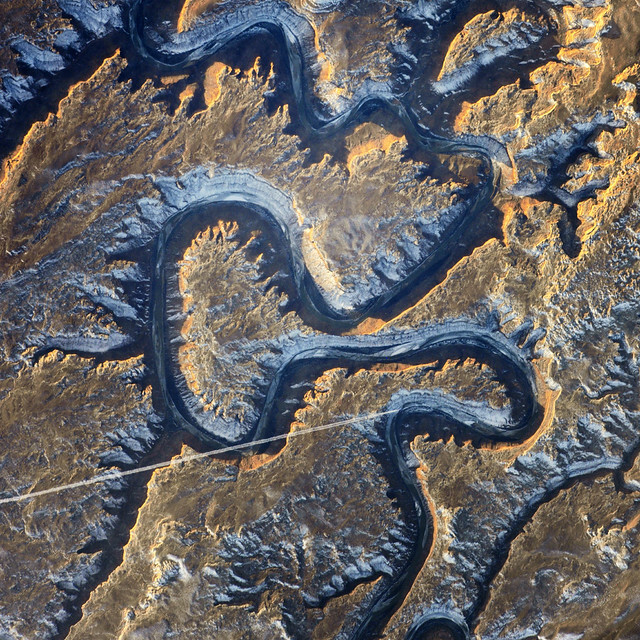 The Green River flows south (toward the top of this image) and joins the Colorado River downstream. The combined flow of these rivers was responsible for cutting the Grand Canyon, some 325 kilometers (200 miles) away from Bowknot. Astronaut photograph ISS038-E-35416 was acquired on January 22, 2014, with a Nikon D3X digital camera using a 1000 millimeter lens, and is provided by the ISS Crew Earth Observations Facility and the Earth Science and Remote Sensing Unit, Johnson Space Center. The image was taken by the Expedition 38 crew. It has been cropped and enhanced to improve contrast, and lens artifacts have been removed. The International Space Station Program supports the laboratory as part of the ISS National Lab to help astronauts take pictures of Earth that will be of the greatest value to scientists and the public, and to make those images freely available on the Internet. Additional images taken by astronauts and cosmonauts can be viewed at the NASA/JSC Gateway to Astronaut Photography of Earth. Caption by M. Justin Wilkinson, Jacobs at NASA-JSC. In Crew Earth Observations (CEO), crewmembers on the International Space Station (ISS) photograph the Earth from their unique point of view located 200 miles above the surface. Photographs record how the planet is changing over time, from human-caused changes like urban growth and reservoir construction, to natural dynamic events such as hurricanes, floods and volcanic eruptions. A major emphasis of CEO is to monitor disaster response events in support of the International Disaster Charter (IDC). CEO imagery provides researchers on Earth with key data to understand the planet from the perspective of the ISS. Crewmembers have been photographing Earth from space since the early Mercury missions beginning in 1961. The continuous images taken from the ISS ensure this record remains unbroken. Fredrik meling, lizandro5, and 93 other people added this photo to their favorites. Fredrik Meling Good morning! Yes, the enhancements on this REALLY bring out the beauty of the terrain. So spectacular !!! Astonishing shapes,twists and curls ; loks like a huge moving snake.Superb illustrations geology wise !!! Looking forward to your relevant post ... TU ! DaniLew Thank you so much! Doda -Maryoga I must say...not a snake I'd want to encounter, at that size! And thank you for the link! Oh, I hope we get a great image for that one! Thank you for sharing your photo here, its visionary!